A Boston-based, Irish government funded immigrant’s rights organization, turned a young Irish girl in to US authorities because she worked in a bar in contradiction of her visa terms. The Irish International Immigrant Center (IIIC) received $253,000 in Irish government funding to help immigrants in 2011. They also received funding from the American Ireland Fund. In all my years covering the Irish American community I have never seen such a callous act inflicted on a young Irish immigrant by an Irish organization allegedly established to help young immigrants. They informed on her to the US State Department after tracking an article she wrote for this publication about her life in America. In the article she mentioned she had tried to make ends meet by working in a bar. She is here legally on a year-long J-1 student visa. In a harshly worded letter that she received, the IIIC stated that her visa was revoked and demanded that she immediately book passage home and leave the country. The letter reads like a missive that immigration authorities would be proud of and the specter of an Irish immigrant rights group (allegedly) playing immigration cop on a vulnerable young woman is a sad one to behold. The alleged immigrant rights organization made over $1 million processing visas over a one year period for Irish students on the J-1 visa, which allows recent college students or graduates to work in the US for one year. 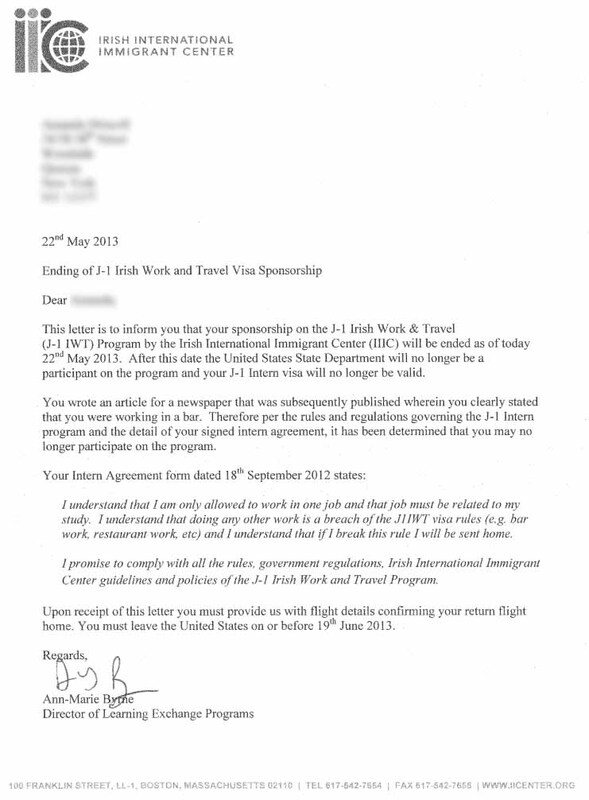 Boston Irish sources said the IIIC is known for nasty and bullying letters which are often received by new legal emigrants for very minor transgressions. Apparently because they profit heavily from every emigrant they process they also feel the need to spy on bully and cajole those they think have stepped out of line in order to preserve their cash cow. Our young intern just happened to be working for us which is why we came across this dreadful betrayal; who knows how many others have stories to tell about the IIIC? I would urge great caution for any would-be immigrant or present immigrant in approaching this organization. What they have done to this young woman -- and who knows how many others they have bullied -- is far outside the pale for an Irish organization, especially one funded by the Irish taxpayer. The IIIC was formerly run by Sister Lena Deevey, a much acknowledged woman in the Irish American community who recently retired. An Irish agency acting as immigration enforcers rather than helping immigrants is a new wrinkle for an Irish group. Monitoring Irish American media looking for “offenders” is positively despicable and McCarthy-like. Perhaps they can go the whole hog and get an U.S. immigration enforcement officer on their staff and nab the undocumented as they arrive. The new IIIC director is Ronnie Miller, and he seemed positively delighted to tell me how they had caught this awful girl in the dreadful act of working in a bar to make ends meet. He knows damn well of course because students find it impossible to survive on intern’s wages that many have to find a way to supplement their income. The J1 visa is a very flawed vehicle in this regard but the lack of basic humanity in how these people deal with students is appalling to witness. I asked friend Ronnie if it was decent at this time of great hope for immigration reform -- at a time when President Obama has suspended almost all deportations of young people -- that the IIIC would ruin a young Irish woman’s American dream by turning her in, informer-style, to U.S. authorities. He said he did not want to discuss the matter any further. An IIC employee, Jude Clarke, a Northern Ireland native like Miller, admitted he had monitored Irish media and saw that the young girl had written she worked in a bar, in addition to interning here at IrishCentral. Shortly afterwards she received a letter signed by another genius, Ann Marie Byrne, director of the IIIC’s Learning Exchange Programs, demanding that she immediately buy a ticket to leave the U.S. Playing the immigration officer, Byrne demanded the girl be gone from the U.S. by June 19, 2013. In all my 30 years in the Irish American media, finding an Irish organization that turns in one of its own for a very minor breach of a visa issue is a new low. It is also unique to find an organization that so cheerfully defends its jackboot tactics and gets substantial Irish government funding while dashing the dreams of young people. Shame on them, and on the Irish government if it continues to fund this organization which picks on defenseless Irish immigrants and turns them in.